The China Study Family Cookbook DOUGHNUTS! When I interviewed Del Sroufe this week on It’s All About Food I knew I would be making this recipe soon. It’s in his newest cookbook, The China Study Family Cookbook. It is a MUST-HAVE vegan cookbook with all kinds of yummy comfort foods made with REAL ingredients, like this doughnut recipe for example. The ingredients that make this recipe so fantastic are the sweet potato and date purees. This recipe may be made with wheat flour OR an All Purpose Gluten-Free Flour. It made be made as a quick bread with baking powder, or allowed to rise with yeast. It’s your choice. I find the doughnuts made with yeast are subtly lighter and springier. In a medium bowl whisk together the flour, 4 Tablespoons cocoa powder, baking powder and salt (if using). In a separate bowl, whisk together the applesauce, 3/4 cup date puree, plant milk and vanilla. Spoon the batter into the wells of a nonstick doughnut pan. In a bowl mix the yeast and 1/4 plant milk. Set aside for about 5 minutes. Mixture with thicken. In a medium bowl whisk together the flour, 4 Tablespoons cocoa powder and salt (if using). In a separate bowl, whisk together the applesauce, 3/4 cup date puree and vanilla. Add in yeast mixture. Spoon the batter into the wells of a nonstick doughnut pan. Let rise in a warm place for 30-60 minutes until double in size. Bake until the doughnuts spring back when gently pressed, 12 to 15 minutes. Let the doughnuts cool slightly in the pan before transferring to a cooling rack to cool completely. While the doughnuts are cooling, combine 1/2 cup sweet potato purée, 1/4 cup date purée, 2 tablespoons nut or seed butter and 3 Tablespoons cocoa powder in a bowl or food processor and mix until smooth and creamy. Spread 2 to 3 tablespoons of the chocolate frosting over each doughnut and serve. 1. 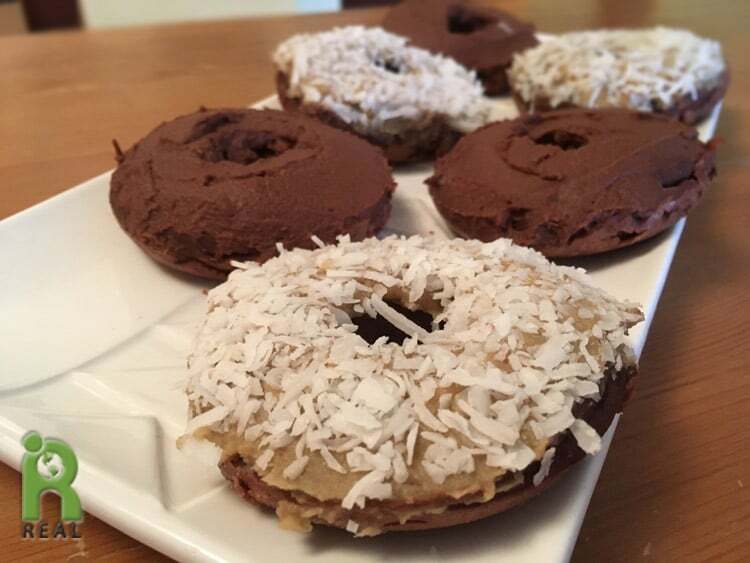 Pour 1/4 cup of unsweetened shredded coconut on a plate and press a frosted doughnut on top to cover it with the coconut. 2. Replace the cocoa powder with Maca Powder and add 1 teaspoon of vanilla for an energizing vanilla frosting. 3. Try sesame tahini or peanut butter in place of the almond butter.